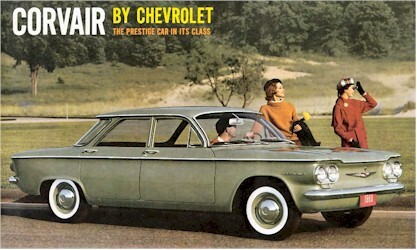 MY Dad had one....I think 1964.....and he flipped it ! "Unsafe at any speed" as per Ralph Nader !!! My father bought one in 1960. It leaked oil from the day he pulled into the driveway. As he explained it, they never perfected the "pancake 6" engine. Also of note: these are the cars in the series "Ultraman"
The 1960-63 Corvair was a major subject of Ralph Nader's 1965 book, "Unsafe at Any Speed".